Let's face it, you need access to relevant data to get the ROI you demand from your content and SEO investment. Search Engine Listing Positions. Search Volume. Cost Per Click. And More. But getting the data you need can be challenging. Quality data may vary from source to source. Authority does not often align with accuracy. 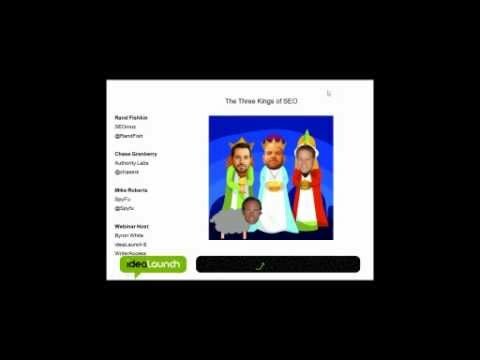 That's why the three kings of SEO are assembling for a special fireside chat, bearing gifts of gold, frankincense and myrrh—just in time for your New Year's planning! Founders Rand Fishkin (SEOMOZ), Chase Granberry (AuthorityLabs), and Mike Roberts (Spyfu) will join host Byron White (ideaLaunch) for this special holiday webinar. You'll listen to these industry know-it-alls dive into the hot SEO topics of 2012 and surface with the wisdom you need for 2013.